For the past four years, David Buchanan has been part of the fabric of the Cobblers and says he would love to end his playing days in the claret and white - but he admits he is still in the dark as to whether he will be staying at the club beyond the end of this season. The 32-year-old is out of contract this summer, and has revealed he has yet to discover whether or not he will be offered a new deal to extend a love affair with the club that began when he signed in the summer of 2015. Buchanan has held talks with boss Keith Curle, but has as yet received no assurances about his future at the at the PTS Academy Stadium, although he has admitted he would love to ‘stay for the rest of his career’. The left-back admits that is something that could be taken out of his hands, but he is hoping his distinguished playing record since Chris Wilder signed him from Preston North End could be a factor in him being offered new terms. 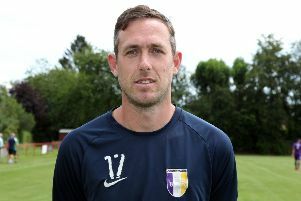 Buchanan was an ever-present in the 2015/16 league two title-winning team, and has made 183 starts and two substitute appearances since joining the club, scoring one goal. He has been involved in all but 24 Cobblers matches in all competitions over his four-year stint, a remarkable record when that has been under six different managers, and he is hoping he can now bring up his 200 appearances and more. “I have spoken to the manager, and hopefully we can get something sorted for next season,” said Buchanan. “It is a busy time for the manager, he has got decisions to make. “I am sure he has already made a few in the back of his mind, and will have those conversations with players when he feels the time is right. “But as a player, when you are out of contract it is a difficult situation, because you just want to know where you stand, especially for myself as I have been here a long time. “Everybody knows the way I feel about this football club, and if I could stay here for the rest of my career then I would. “It doesn’t always work like that, as you have to be in the manager’s plans, and hopefully I am going forward. “If we come to some sort of deal it won’t take me long to agree a contract, but is has to be right for me, it has to be right for my family. Buchanan is hoping the fact he has been a key man for Curle since he took over as manager will stand him in good stead when it comes to those contract talks, as well as his exemplary fitness record. The Rochdale-born defender has made 42 appearances for Town in all this season, starting 35 of the 41 Sky Bet League Two fixtures, and Buchanan said: “I think there is only Dai Cornell has played more games than me this season, and he has played every minute of every game as the goalkeeper, so that tells you something. “I feel as though I have done my job, I feel as though I do the job to the best of my ability every time I put the shirt on for Northampton. 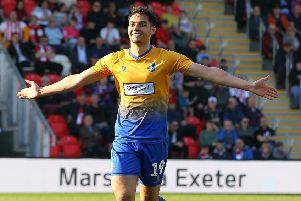 “I think I have been consistent since the minute I walked through the door, albeit you can’t play well every week, and that is why we are league two footballers. “But I think that with the fans at this football club, as long as you give 100 per cent every week and show that you care, that is what it is all about. “This county has become my home really, and as I have said, everybody knows how I feel about this football team, and if I could stay here for the rest of my career I would. “But football doesn’t work like that. The contract has to be right for me, but also on the other side the deal has to be right for the football club if they want me to stay. “They have to work to budgets, they have ideas and ambitions for where they want to be. And on that remarkable appearance record for the club, Buchanan said: “I like to pride myself on my fitness. “I can’t remember the last training session I missed, and I have been available for every game for the past, well I have been here for nearly four years.